When Jim Edmonds entered Wrigley Field for the first time this season, he was booed mercilessly. And he was wearing patrolling center field for the homestanding Chicago Cubs. Edmonds' slow start added fuel to the fire, as it looked like another Jim Hendry reclamation project had failed. But then Edmonds, who started to hit his stride with a 3-for-4 day in the Cubs' 10-9 come-from-behind victory against the Colorado Rockies, found his niche and Cubdom found a home for a former Cub-killer. 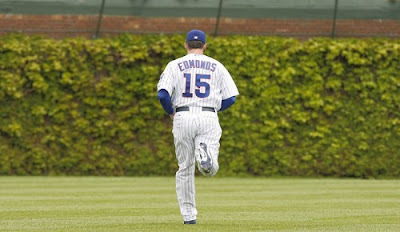 Since joining the Cubs, Edmonds has filled the role of left-handed hitting center fielder with 16 home runs and 44 RBIs. His .374 on-base percentage is his best since he posted a .385 OBP in 2005 with the St. Louis Cardinals. So where does the love for the former Cub-killer come from? Probably Edmonds' performances against two of the Cubs' chief rivals. "Jimmy Baseball" hit .316 with three home runs against the Chicago White Sox and got the attention of ChiSox manager Ozzie Guillen, who said he wasn't afraid of facing Edmonds in a key situation. The next night, Guillen pitched around Edmonds with an intentional walk. Edmonds is only hitting .111 against the Cards, but has a two homer game against his former mates and has been at odds with former manager Tony LaRussa since leaving St. Louis. And nothing makes you a "true Cub" like battling the skippers of the Cardinals and White Sox, right? Overall, Edmonds has been a key acquisition for the Cubs. His offense has been good enough to keep the bottom of the order somewhat potent and his defense has been superb for a 38-year-old that looked to be on his last legs coming into the season. Can he keep it up? He's 38. They've got drugs for that now.